Do you have a book with SAT scores by town for all of Massachusetts? I didn't think we would have anything in print with scores down to the town level, so I told them I'd search online. They said they had been and couldn't find anything - I told them I'd try anyway, and I'd come get them if I found something (said the librarian, with confidence). The first place I went was the MA Department of Education website, but a search for SAT scores didn't provide statistics, just news articles about trends. Next I tried a general web search for SAT scores by town Massachusetts, which did produce a Boston Globe article with scores by schools from 2006. Since this proved such data was available, I thought surely the DOE website must have something. So I searched again limiting to site:doe.mass.edu (actually, at first I just typed in .gov, but it turns out the DOE website is a .edu - huh), and found the exact same Boston Globe data on the DOE website - plus data from previous years. It always bugs me when Google's site: limiter search works better than a website's own native search, but at least I found something. And finally, I searched around CollegeBoard.com to see if they had breakdowns of SAT scores. All I could find there were national percentile tables, but that seems like it might be useful, too. I went to the study room to tell the kids what I found, and they were pretty happy. Of course, since everything I found was online, the only real way to get it to them was to get the email address of one of the girls in the group and email her the URLs - which seems a little awkward to me, but it worked well enough in this case. Let me know if you guys need anything else. They stayed in the room for an hour or so more, and stopped by the desk to thank me on the way out. How nice. Even though I use Google for web searching most of the time, I do use other search engines, and I wonder how the results compare. With the launch of Microsoft's new Bing search engine, a Microsoft employee must have been wondering the same thing - so he created a neat Blind Search tool (and states this is not a Microsoft project). 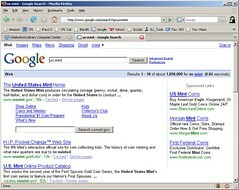 Type in a search term, and Blind Search shows you the results from Google, Yahoo and Bing - but without telling you which engine produced each list. So without brand bias, you decide which results list includes the most relevant websites. And the best part is the reveal, when you "vote" and see which search engine the results came from. I played a bit, and surprisingly, Google didn't always provide the most relevant results. As the creator states, this seems most useful as an observational curiosity, but it certainly is fun and interesting (or, it gives people a way to find pron three times faster). When I use Google to find information, I often use the "site" limiter to improve the returns. For instance, when looking for information on the new economic stimulus tax rebate thing, a search for "tax rebate site:irs.gov" gives much more direct information than does just searching for "tax rebate." Which is great if you know the domain to which you'd like to limit your search, but yesterday, I didn't. Someone was looking for information on the James Madison dollar coin, and the U.S. Mint website seemed the most logical place to look for it. However, I didn't know the Mint's domain name. So before my usual site-specific search, I first searched for "us mint" to get the domain, and then I was going to run a second search limited to that domain. But Google is one step ahead of me (I don't know if this is a new feature or if I just never noticed it before): my search for U.S. Mint returned the Mint's website as the first result, and the listing included a site search built right in to the search result (see picture). Neat. And it saves me a step. Searching there for "james madison dollar" gave exactly what the patron was looking for as the first result. I'm generally skeptical of Google as a company for hording private data, but they do have smart people working there.